The best cleaner for marble shower mold shouldn't cause damage to the marble itself. That means it won't be abrasive or acid-based. Using harsh cleansers can etch the surface, dulling the polish. It is advised to look for a pH-neutral stone cleaner, mix it with hot water, then rinse. 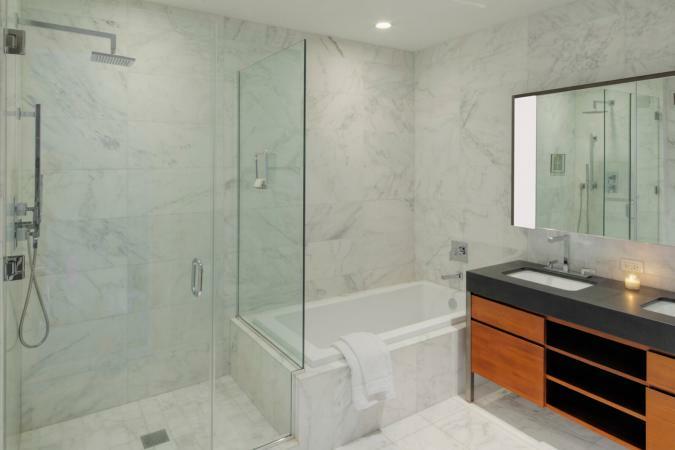 Using soft cloths or sponges when cleaning and drying your marble shower is best. The requirements for the best cleaner for marble shower mold exclude most common cleaners, such as solutions that contain vinegar, ammonia, lemon, orange, and most of the cleaners designed for bathroom grout and tiles. So what's left to clean high quality marble? MB Stone Care has been in business since 1989, focusing on cleaning and maintaining marble and other stone surfaces. The company's Mildew Stain Remover praised by Amazon reviewers saying the cleaner brings dirty marble showers back to life with lasting effects that don't damage the marble. Additionally, top cleaner recommended by marble experts, Countertop Speciality, is Stone Care: MB-5 Granite and Marble Cleaning Spray. Reviewers love this gentle, yet reliable product and state they would purchase it again to clean their granite. With either cleaner, you'll get the job done and won't have to scrub! This Marble Life product was reviewed by themarblecleaner.com against a wide variety of other marble cleaners. MarbleLife was rank number one for its ability to remove 95 to 100 percent of dirt, a balanced pH, and streak-free, restoration of marble color. Customer reviews suggest this is a winning product that won't destroy marble while removing the mold, but they don't love the high price. Black Diamond Stoneworks Granite Plus Cleaner is ranked as Amazon's top choice. This cleaner is a two-in-one product containing a cleaner and a sealer that is safe and pH neutral. Reviewers praise this cleaner for repelling water and stains, especially for a low price. Simple Green 18401 Stone Cleaner is a top rated marble and stone cleaner according to howtocleanmarble.org. The cleaner receives five star customer ratings on Amazon, is pH balanced, and is safe for kids and pets. Reviewers like this cleaner because it doesn't give of a harsh, chemical smell and is free of harmful chemicals. Queen of the household, MarthaStewart.com, recommends Miracle Sealants Tile and Stone Cleaner for stone and marble cleaning. At an affordable cost, this cleaner has been praised for being "the only product used on granite countertops" by some reviewers. TopRatedKitchen.com ranks Granite Gold Daily Cleaner among their top marble and granite cleaning products. This cleaner is pH balanced, meaning it is less likely to irritate skin and is kid and pet friendly. However, this spray cleaner is not to be used on floor.